Bill Warner, Avid’s founder, has posted some fascinating early videos, from as far back as 1987, on the Viddler site. Several cover the earliest Avid prototype, a system that simply played a few clips and could assemble them together. Everything ran out of RAM — on an Apollo minicomputer. 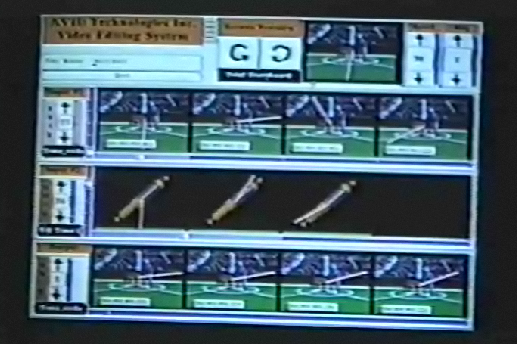 They had no way to digitize anything, so for testing they created short clips out of stills with a superimposed moving line to let you know something was changing. It’s a real and raw look at the genesis of a system and metaphor that we all take for granted now. This early version didn’t have a source or record monitor or much of a timeline. But in Bill’s comments you already hear the idea of three-point editing and the distinction between an insert and an overwrite. In a strange twist, the prototype bears a certain conceptual resemblance to iMovie ’08. For those of you who were part of the revolution back then there’s also a video featuring “The Visitor,” which we all used as practice material. A segment from a local news show and an early Avid promotional video are also included. The videos are here. They’re in reverse chronological order — the oldest is last in the list. This entry was posted on November 29, 2008 at 1:18 pm and is filed under Avid, User Interface. You can subscribe via RSS 2.0 feed to this post's comments. You can skip to the end and leave a response. Pinging is currently not allowed.